Info; I joined the RAF in 1965 and flew a number of aircraft. 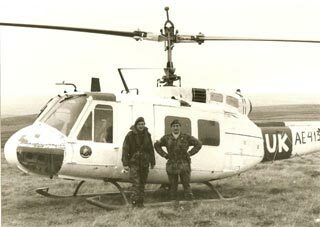 Whilst serving in the Falklands I “borrowed” a huey from the other side and brought it home! 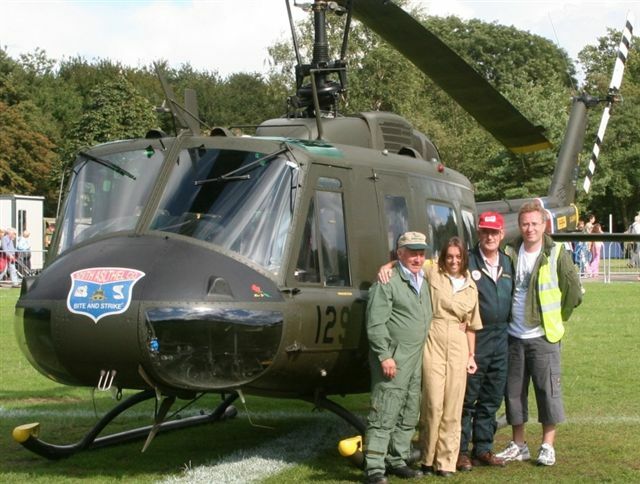 Once she was rebuilt and registered under G-HUEY, I was involved in flying her around the air show circuit for a number of years in aid of the RAF Benevolent Fund. I met Phil and Jo at the London Air Show in April 2006 and Phil asked me if I wanted to get involved with this project. I didn’t need asking twice! It had been 16 years since I’d flown a huey so I had to renew my licence. I then gained my Display Authorisation. Career Details and aviation experience. Originally trained as a Naval Architect at the shipbuilding yards in Newcastle but became seduced by flying during membership of University Air Squadron 1962 to 1965, flying Chipmunks. First solo 28 April 1962. Joined Royal Air Force in 1965 and trained on Jet Provost Mk 3 and 4. 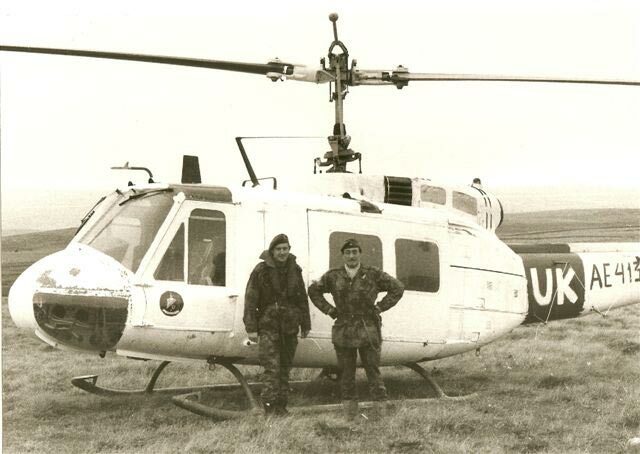 Trained as a helicopter pilot Oct 1966 flying the Bell 47 Sioux and Whirlwind Mk 10. Converted to Wessex Mk 2 in Aug 67. Joined 18 Squadron at Gutersloh in Sept 67. Posted to RAF Sharjah, Persian Gulf, April 70 still flying the Wessex Mk 2. Started instructor training on the Sioux July 1971. Became dual qualified to instruct and examine on Sioux and Whirlwind Mk10 Sept 1972. Joined No 13 Rotary Wing Empire Test Pilots Course Jan 1975. Flew Scout, Wessex Mk 3, Puma, Sea King Mk1, Basset, Lightning, Hunter, Argosy, Allouette and Whirlwind Mk 7 during the course. Joined Rotary Test Squadron, Boscombe Down in Dec 1975. During tour flew Wessex Mks1 ,3, 5, and H34, Puma (development version, RAF version and Super Puma), Gazelle, Sea King Mks1, 2 and 3, Scout, Whirlwind Mk7, Lynx Mk 1, Sioux, Allouette, CH53 and Chinook. Main project aircraft underlined. Air Liaison Officer 8 Field Force May 79 to Dec 80. i/c aircraft tasking for the Commonwealth Ceasefire Liaison and Monitoring Organisation, Rhodesia/Zimbabwe 79/80. Air Liaison Officer 5 Infantry Brigade Jan 81 to Oct 82. 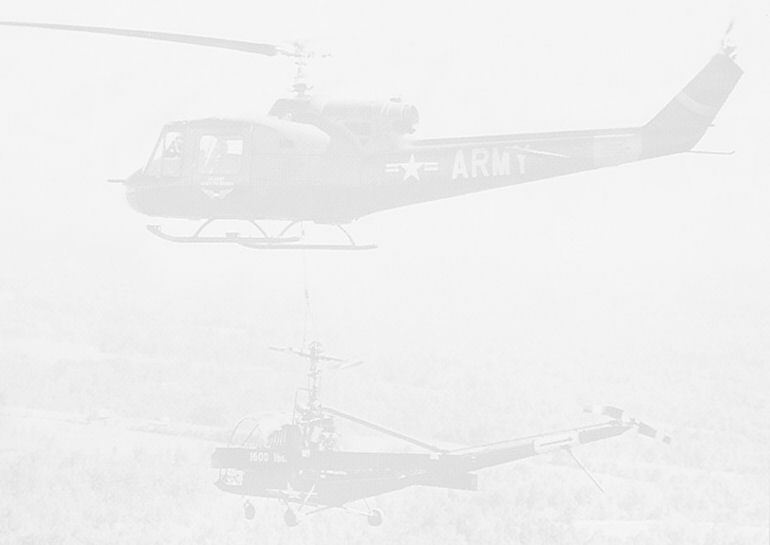 Including the Falklands Conflict during which ‘borrowed’ a Huey from other side that eventually became G-HUEY. Flown in support of Brigade HQ for several weeks following ceasefire. Squadron Leader Operations RAF Odiham. Oct 82 to Aug 85. Useful for all the facilities for helping to re-build G-HUEY. HQ British Force Falkland Islands. Aug 85 to Dec 85. Again useful, as officially endorsed to rob any surviving Hueys on the islands of useful components. RAFLO Fort Halstead, Kent. Dec 85 to Sept 88. Useful again, as great support given by unit workshops for G-HUEY Project. OC Ground Training Squadron, RAF Shawbury. Sept 88 to Sept 91. 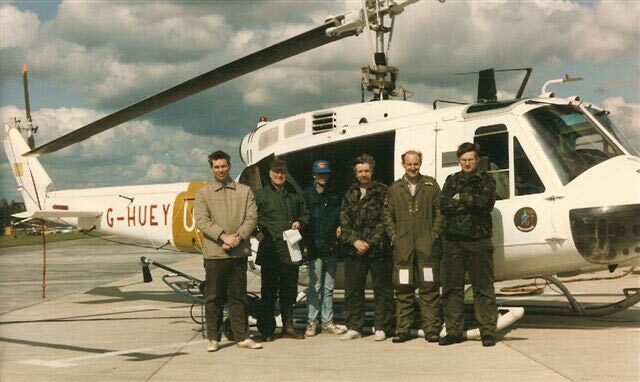 Again Station offered magnificent support until G-HUEY project ended Sept 90. Bursar, Heathfield School. Dec 91 to Jul 2004. A significant change to the Air Force. Maintained flying licenses throughout. Worst Flying Moments . Two particularly stick in my mind. First, when a Phantom flew between my formation leader and myself whilst in Tac Formation . Almighty bang, Wessex ‘capsized’; bought it upright and looked right; saw 2 almighty ‘dustbins’ fast receding. Landed in a field and inspected the machine. Everything seemed OK so continued with task. Then got ‘bollocked’ by Boss on return for not summoning technical inspection!! They found nothing wrong either. Second, when the crewman fell out of the aircraft during a practice for the Queen’s Review at Abingdon whilst we were carrying a 105mm gun underslung. Suddenly all went quiet on the intercomm and repeated calls by me for the crewman to reply went unanswered. Opened the window and looked down to see a pair of legs flutter into view followed by a head and arms – he was fortunately suspended, like a sack of potatoes, about 6 foot below the aircraft on his monkey harness but with the intercomm lead disconnected. Landed the gun on the ground, moved sideways and landed the crewman on the ground. Very apologetic when he re-established comms. Lesson learnt; adjust the length of the monkey harness so one cannot fall out of the aircraft. Best Flying Moment. 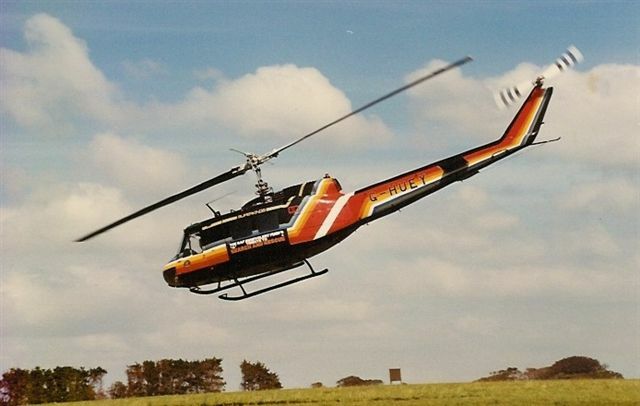 Without doubt, the first flight in G-HUEY after the 3.5 year rebuild. This flight was done with local TV in attendance as well as Sir Rex Hunt, the then ex-Governor of the Falklands Islands watching. So many people had told us not to waste our time, it would never fly again. It was wonderful to have proved them wrong. But on the start up for the third flight all seemed lost as the cabin filled with the acrid smoke of burning electrical cables. We quickly identified that an electric fuel pump had seized, overloaded the circuit because the circuit breaker had failed to activate and so the wiring was the next weakest link. Continued the flight with just the other fuel pump working. Fortunately, no other required circuit seemed to have been affected. Replaced all the affected wiring the following winter.